Quinoa is the Mickey Rooney of grains, small in stature but big on texture and taste. 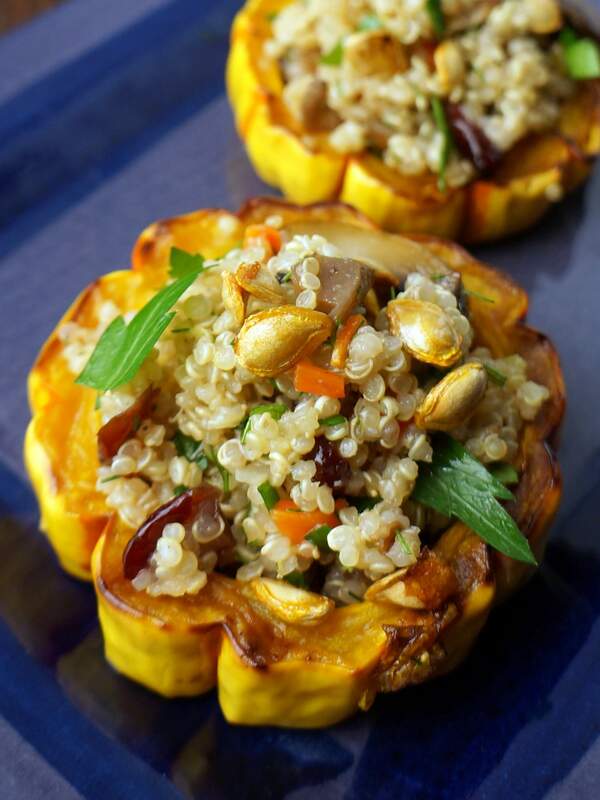 Slices of squash are the perfect portion control for the nutty grain in this recipe for Roasted Squash Rings Stuffed with Quinoa Mushroom Salad. You can even include it on your Thanksgiving buffet. Cook the squash rings and make the quinoa salad a couple of days ahead and you can serve it on your Thanksgiving buffet. Don’t be deceived by quinoa’s diminutive size because this grain speaks for itself. You’ll enjoy seasoning it aggressively. In the fall, I opt for something traditional that mimics poultry stuffing and the flavors that go with with turkey; carrots, celery, mushrooms and cranberry. Don’t let the “diced fine” in this recipe intimidate you. Yes, it sounds fussy, but it is not a test of your knife skills. Small uniform pieces of the vegetables match the scale of the quinoa making it pleasing to chew. If you prefer washing an appliance, pulverize the carrots and celery in a food processor. Barely larger than poppy seeds, the pearls of quinoa burst during cooking. You want to see little white rings throughout the cooked quinoa to know that each individual grain is hydrated and tender. That’s the test I use along with a nibble to make sure the grains are tender. This recipe was developed to share with the readers of The E List, Erica Tannen’s “Excruciatingly Opinionated Guide to the Connecticut Shoreline.” It’s a weekly electronic newsletter of all that is fun, delicious, healthful and interesting. Everyone who lives here reads it. You should too. 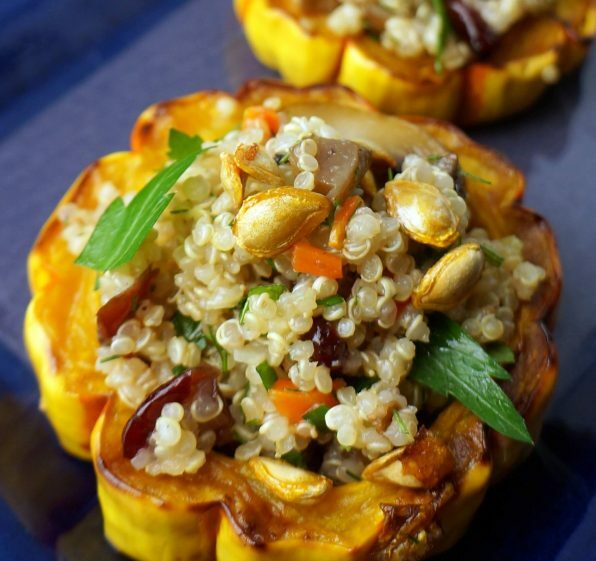 Slices of squash are the perfect portion control for this recipe, nutty Roasted Squash Rings Stuffed with Quinoa Mushroom Salad. Serve it for lunch on your Thanksgiving buffet. Cook the squash rings and make the quinoa salad a couple of days ahead. Preheat the oven to 400°F. Brush a parchment- or foil-lined baking sheet with 1 Tablespoon of the olive oil. Wash and dry the squash. Cut it into ¾-inch thick slices. Remove the seeds. Save them to toast and use as a garnish. Rinse the quinoa in a fine strainer under cold running water. Pick out any dark seeds and debris. Combine the quinoa with the stock in a small saucepan. Bring to a boil. Cover, then reduce heat and simmer until the quinoa is tender and popped and all of the stock has been absorbed, for approximately 10 – 15 minutes. Spoon it into a bowl. Sauté the celery and carrots in the remaining 1 Tablespoon of olive oil until almost tender, for about 6 – 8 minutes. Add the shallots and mushrooms and a little more olive oil, if needed, and continue to cook, over medium heat until the mushrooms are tender, 5 or 6 more minutes. Add the cooked vegetables and cranberries to the hot cooked quinoa. Add the lemon juice and zest. Adjust the seasonings as needed. To make the Toasted Squash Seeds garnish, rinse the reserved squash seeds in a strainer under cold water. Dry them on a layer of thick paper towels. Use the paper towels to rub off any fiber that clings to the seeds. Spread the seeds out onto a baking sheet lined with parchment or foil. Drizzle them with the olive oil. Sprinkle with salt. Roast the seeds at 350°F until they are lightly brown and crunchy, for approximately 6 – 8 minutes. You’ll know they are almost done when you hear them popping. To serve, reheat the squash rings if necessary. Place one squash ring on each serving plate. Spoon a generous mound of the quinoa salad into the center of each squash ring. Garnish with a few sprigs of fresh parsley. Scatter some of the toasted seeds, if using, on top of each serving. And drizzle with balsamic vinegar glaze if you want to gild the lily. Or place the squash rings onto an oven-to-table serving platter. Fill each ring with some of the quinoa salad and garnish. Keep the squash rings warm in a low oven. To serve from a buffet, slide a flat metal spatula to lift each filled ring onto serving plates.